I think your use of the Phoenix example to disparage light rail as a mode is misguided. Phoenix certainly is a terrible example, but it isn't representative of light rail installations everywhere. There are several systems that are installed for well below $10k per daily passenger. When you consider that light rail systems have a depreciable lifespan of between 30 and 50 years, that capital cost is quite impressive in comparison to a Prius that might be kept for 10 years. Operating costs per passenger are mostly a result of the inverse of ridership. Calgary's system has operating costs hovering around $160 per car per hour. At fares of $2.75 per ride, that means that a light rail train needs about 59 adult passengers per hour to break even. At an average of about 600 passengers per train per hour, they are paying enough to cover a completely empty return trip, which doesn't actually happen. Since the marginal cost per passenger is so minimal (measured in fractions of a cent in some cases), light rail systems really respond to scale. In some cases, a light rail system has run operating deficits for the first few years, but ridership growth overtakes those operating deficits and soon the systems become revenue generators. The real benefit of light rail systems is the capacity. Rail can increase the effective density capacity of a city. Using just car-based transportation, there is an upper threshold to the allowable density that is well below that of a car+light rail system. Most systems can handle around 8,000 passengers per hour without any upgrades, and can handle 20,000 passengers per hour with just rolling stock increases. With signal upgrades and additional rolling stock, a double tracked system can handle 40,000 passengers per hour. Even at your liberal 1.5 passengers/car, that is the equivalent of seven lanes of traffic per direction. If allowed, ridership does build over time. Some systems have experienced ridership stagnation, but this is most likely a result of the zoning systems of the city. Cities that take no action in redesigning their zoning around light rail systems tend to plateau early and low. Phoenix will likely follow this path. Most liberals think that the path to higher ridership involves up-zoning. In other words, they change the zoning so that if anyone wants to develop within the area of a light rail station, they can only do it if their development meets the required density. In terms of increasing ridership, this tactic has worked, although I don't know enough about the costs to say whether it is a good idea or not. Recently we have witnessed the experience of Houston's light rail system which within a few short years became the 2nd highest ridership per mile and lowest capital cost per passenger for any system in the US. Notice that Houston does not have zoning laws. I don't know enough to imply causation, but it does seem that a lack of zoning rules allows extremely fast ridership growth. I guess my point with all of this is that it isn't light rail as a modal technology that is a failure. Light rail systems can be a failure if designed improperly, but they can also be a success...even under your definition of success... if designed well. Here on Oahu they're trying to shove rail down our throats. It's even more stupid than HOV lanes. "people in Phoenix are driving from all over to all over"
That commute pattern is exactly what you want on a street network because it greatly reduces congestion. Making everybody go to the same place is an insane traffic pattern. It's just as stupid on a road network as it is on a computer network. If you have a density fetish with an authoritarian streak, as most urban planners do, then light rail is great. Otherwise, it's a failure pretty much everywhere, unless your definition of success is so loose it's meaningless. Houston's system is no exception. Read Houston's Clear Thinkers for a rundown on the idiocy that is Houston light rail. Website is very comprehensive and informative. I have enjoyed the visit. From http://www.quickflowersberlin.com. Some cities grew up with cars and highways as the primary mode of transit. Because of this they're dispersed. Once dispersed, you can't make "Downtown" happen no matter how much you urban plan. Does Phoenix have an industrial center? Really, that's where the light rail lines should concentrate. If not, someone should think of putting a nice rendering plant or aluminum smelter right near the central hub of those rail lines. Danny, good compare and contrast there between Houston and Phoenix. I bet that would make a great project for an MBA thesis. Light Rail makes those central planners feel like they are in Europe, and isn't that the goal? We have a wonderful rail system; it carries things instead of people, and most are completely unaware that it is the most efficient transportation system in the world. "That commute pattern is exactly what you want on a street network because it greatly reduces congestion. Making everybody go to the same place is an insane traffic pattern. Itâ€™s just as stupid on a road network as it is on a computer network." It might be exactly what you want if you are an authoritarian central planner obsessed with only one aspect of city design. It sounds like that is exactly what you are. Intelligent non-central-planners understand that there are a lot of reasons why productive people congregate together that have nothing to do with traffic. In fact, the reasons are so strong that they do it in spite of traffic. "If you have a density fetish with an authoritarian streak, as most urban planners do, then light rail is great. Otherwise, itâ€™s a failure pretty much everywhere, unless your definition of success is so loose itâ€™s meaningless. Houstonâ€™s system is no exception. Read Houstonâ€™s Clear Thinkers for a rundown on the idiocy that is Houston light rail." Private for-profit streetcar companies flourished in this country before authoritarian zoning and subsidized roadbuilding efforts commenced. They thrived because people actually liked them and used them as a cost effective means to get where they needed to go on a regular basis. Streetcars didn't fall out of favor until central planners changed where people needed to go and where they came from. Until then, cars were a toy for weekends. "We have a wonderful rail system; it carries things instead of people, and most are completely unaware that it is the most efficient transportation system in the world." Intracity rail systems and even intercity rail systems are not the result of sacrificing freight rail. Passenger rail used to account for about 40% of Class I railroad revenues. It stopped being that way when governments intervened in city planning, infrastructure building, and "common good" railroad regulation. There are cities in America where rail makes sense. Know how you can tell what cities those are? They already have it, and have had it for decades. Keep in mind that government owned light rail systems provides another opportunity to add workers to the government rolls (SEIU payback). I lived and worked in downtown Chicago and downtown Boston. I took the passenger train to work most of the time. These systems had to be subsidized by local/state government because they couldn't cover the cost of operation from the ridership. Light rail service in Chicago and Boston was a viable transportation option until corrupted by government oversight. The New York City subway was actually built by competing private companies (BMT, IRT, IND). The promoters made money by selling choice real estate in the outer boroughs they served. Parts of Brooklyn, a lot of The Bronx, and almost all of Queens built up around where the subways were. Subways work well when they're big enough to have a network effect. Some guys from my high school are in the Guiness Book for fastest traverse of the whole NYC system -- it took 23 hours. NYC's commuter rail works for the suburbs because we had a big downtown first -- there was ridership demand. Building the commuter rail affected the course of residential demand, but you needed a downtown first. From growing up in NYC, I see light rail as a bad and ineffective joke. But reliance on cars often means that some cities choke when they grow past a million or so in their greater metroplitian areas. That's often how promoters make money off things like ski resorts too. Sorry, I meant to delete the gibberish at the bottom of the last post ... everyhting after "from"
The local Tampa news media have been trumpetting the success of Phoenix light rail for quite some time. I doubt your article will get a reprint in any of our local media. There is a ballot initiative in November to raise the local sales tax to pay for "transportation." That's code for "whatever our biggest contributors tell us to build." Tampa is even less dense than Phoenix, and there is a large bay that seperates about 1 million people in the St Petersburg area from 1 million people in Tampa. There's no plan to build any mass transit to span the bay; that is something that might make some sense. The local politicos couldn't figure out who would get the to hold the scissors at the ribbon cutting. We've got a trolley, really a glorified bus on rails, that runs about 3 miles from one tourist trap area to another. It cost millions to build, and has been losing money ever since. Of course, bus service in poorer neighborhoods has been cut back to keep the trolley going for the tourists. marco73, don't forget the light rail from Tampa to Orlando. In some cases, a light rail system has run operating deficits for the first few years, but ridership growth overtakes those operating deficits and soon the systems become revenue generators. Name one system in the US where this has actually happened. Rail can increase the effective density capacity of a city. Using just car-based transportation, there is an upper threshold to the allowable density that is well below that of a car+light rail system. Most systems can handle around 8,000 passengers per hour without any upgrades, and can handle 20,000 passengers per hour with just rolling stock increases. With signal upgrades and additional rolling stock, a double tracked system can handle 40,000 passengers per hour. Even at your liberal 1.5 passengers/car, that is the equivalent of seven lanes of traffic per direction. Apparently, you are comparing the theoretical capacity of rail systems with observed capacity auto-based systems. There is no light rail system in the country that even approaches the capacity numbers you suggest. The only U.S. system that achieves this kind of volume is the New York subway. And the last time I checked, no other city was trying to re-create those conditions. "Density capacity" is just not an issue for most American cities. I think you should modify the "Prius bet" to reflect more contemporary "progressive" values. The environment is no longer the hot-button issue in planning circles. Instead, they have turned their attention to obesity and public health. The same prescriptions hold, but the rationalization is different. Fortunately, Peter Gordon has taken a stab at this and suggested buying all rail users a bus pass plus a health club membership. Two birds with one stone, plus a large savings for governments. Who could disagree? I'd like to know how you calculate the cost and value of a light rail system. Denver has a strange history with rail. 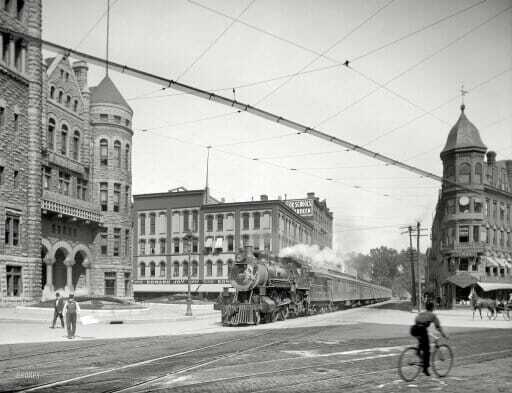 At the turn of the century real estate developers built and maintained rail systems to transport homeowners from the "distant" communities they were building to the downtown area. It created these really amazing commercial pockets within residential areas where the old train stations used to be. As cars became more common the companies who owned the rails sold them to a sucker of a city government, but without significantly charging for the transport they couldn't afford to maintain the system. The city then sold the rails to a tire company which dismantled the whole system to make room for tires. Today Denver is building a new rail system. Near the new light rail stations land values have shot up along with immense condo buildings and commercial development. The light rail *created* density. I should also mention that the Denver light rail is also very busy. But then Denver doesn't have the same degree of real estate hell that Phoenix does. We can still sell property on occasion. I think you're not thinking far enough into the future. The current suburban sprawled city designs are idiotic. Light rail is a maneuver to centralize the population and increase density as much as it is to compensate for existing density. "...systems become revenue generators." Um. Well. I guess I can't really argue with that since the public light rail systems do generate *revenue*. This starts as soon as they start selling fares. The question is when/where is the break-even when you add in operating costs. This is often more than just a "few" years (if ever). Even when Chicago announced they finally turned a profit on the "El", it turned out it was only achieved by deferring maintenance (again, and again, and again, and again). Danny writes: "Operating costs per passenger are mostly a result of the inverse of ridership. Calgaryâ€™s system has operating costs hovering around $160 per car per hour. At fares of $2.75 per ride, that means that a light rail train needs about 59 adult passengers per hour to break even. At an average of about 600 passengers per train per hour, they are paying enough to cover a completely empty return trip, which doesnâ€™t actually happen." I meant train, not car. Sorry about the confusion. Adding a car usually adds about $3-5/ hour to the operating costs, so it is pretty minimal. Calgary typically runs 2-3 car trains, so I'm assuming the $160 is for somewhere between 2 and 3 cars. As to the other comments, they have to do more with American governments that run the systems than they do with the technology or appropriateness of the technology for American cities. There isn't a single American city that is running operating surpluses. I have worked as a consultant in infrastructure industries and I have worked hands-on with some of the systems. I can tell you right now that there are 12 rail systems (some light rail, some heavy rail) that would be running operating profits if wage levels were in line with private sector wages. There are a handful of light rail systems that would be running operating profits if their procurement decisions were not made by people with a grand total of 13 brain cells (if Phoenix could boost their ridership by about 30%, this would fit for Phoenix as well). Boston could be making about $300k per day in operating surplus if their labor and procurement costs were in line with Calgary, Edmonton, or Nottingham. Houston could easily be making an operating profit right now if they actually enforced their fares correctly...their average revenue per ticket is below $.50! There are plenty of cities that are similar to American cities in urban design that do perfectly well with light rail. In terms of density capacity, light rail is definitely capable for most American cities. Calgary, whose density is the same level as Houston, seems to do really well with their system. Operating costs are around $.26 per rider, but fares are $2.75 for adults and $1.75 for youth. Since the majority of movement happens during rush hour in pretty much any US city, density capacity IS an issue for most cities. Capacity matters, because unless your city doesn't have any congestion, they have a transportation capacity problem. Light rail may not get rid of auto congestion, but it does allow more people to travel at the same time without contributing to more congestion. Caseyboy - you are correct about potential rail service between Tampa and Orlando. But that will be high speed rail, not light. Planners are talking about a 200 - 300 mph train traveling about 75 miles. A better physicist than I could provide some interesting numbers for the energy necessary to accelerate a many-ton train up to 300 mph, then brake that train to a stop, all in 75 miles. Taxpayers are already paying for soil surveys in the median of Interstate 4, the main highway between Tampa and Orlando. Of course, no one wants to point out that the median of I4 is too curvy and hilly for a 300 mph train. The land between Tampa and Orlando may look empty on a map, but any new high speed railway would have to cut through growing suburbs of both cities, and some unique environmentally sensitive land. Amtrak already runs rail service between Tampa and Orlando. Dozens of people every day make use of that service. And dozens sounds like about how many people will use daily high speed rail between Tampa and Orlando. All at a cost of only a few billion dollars. "Light rail", high speed rail lines, and other government planned construction all would make financial sense if we could import Irish, Italian, and Chinese immigrants, pay them $0.22/hour, work them 84 hours per week, and not really worry about trivial things like OSHA standards and the occasional daily fatalities and loss of limbs. Actually, they didn't all flourish. In fact, most of them did quite the opposite and struggled financially until the 1910s and 1920s. The central planners didn't change where people went. People got more wealthy and wanted bigger cars and bigger homes. Building to these new locations required too much capital (aka it was too expensive). But even if they could have people wanted to drive. The car afforded them some semblence of privacy, saved them time plus other conviniences. Light rail may not get rid of auto congestion, but it does allow more people to travel at the same time without contributing to more congestion. That's not what happened with MN55 when they built the Hiawatha line in Minneapolis. The line parrallels the highway and has made congestion worse. I definitely understand both sides of this debate. Danny made a good point, allot of the municipal systems run with huge wage burdens that wouldn't exist in the private sector (the same problem plagues the bus systems as well). And its entirely possible that a few cities could be running surpluses on their system have they not be flogged by the union contract. On the flip side the fact that light rail is limited in is ability to serve a population makes the investment REALLY expensive and requires a long time span before it can pay itself off. This requires the cities to allow for massive redevelopment of the entire route to justify using the light rail, and I just don't see this happening with the future planning of the Phoenix area. I live in the Buffalo area and the ever shrinking city in New York has its own subway/light rail. Its a nice feature but its in truth absolutely useless for anything other than for those who live in Buffalo and work downtown OR going to a hockey game where instead of driving downtown and fighting for a parking space, you park at the northern end and ride it all the way to the Arena. And it gets packed when the Sabres are playing at home during a hot streak. Arguing that the train operations would be "profitable" except for the huge wage burdens is IDIOTIC. These wages existed BEFORE the decision to build the rail lines. The governments knew that to build the lines they would have to comply with Bacon-Davis and pay out exorbitant union wages, and that the workers who operated the line would be civil servants belonging to public service unions, and hence vastly overcompensated. YOu can see my "comeback" above. The big inner city subways were built with cheap immigrant labor. If the citizens of the country were allowed to pay MARKET WAGE RATES for our public infrastructure spending we would see the cost of public projects fall significantly: my guess would be that the costs would be HALF of what exists now. Thatâ€™s not what happened with MN55 when they built the Hiawatha line in Minneapolis. The line parrallels the highway and has made congestion worse. That's correct. In fact, the planners didn't even try to hide it. One of the local papers caught wind of a document which revealed that increasing delays at signalized intersections, while technically a cost, since it wastes valuable resources (fuel and people's time), was actually a strategy that the planners were banking on to give the trains a "competitive advantage" over users of the parallel highway. I think light rail now needs some innovation to get back on the lines. You are all making comments, like it is supposed to be a money maker. It is, and will be more, an absolute necessity. No one talks of the highway system's profits. How much "profit" did the the 10 make. None. It was not expected to. It's a necessity that, with out it, the city would have little chance of survival. The highway system that has placed Phoenix as one of the most "car-centric" metro areas in the country. As Phoenix grows, it will need alternatives. People will begin moving into the center because traffic and necessity will dictate. The light-rail system will be an integral part of Phoenixs future. With out question.